It's time for Summer Mini Sessions! Join me for a casual, fun 30 minute long engagement session in Marietta Square. Sessions will be held between the hours 2:00 PM and 6:00 PM. Photos from your sessions will be placed in an online gallery on our website within two weeks of your session. 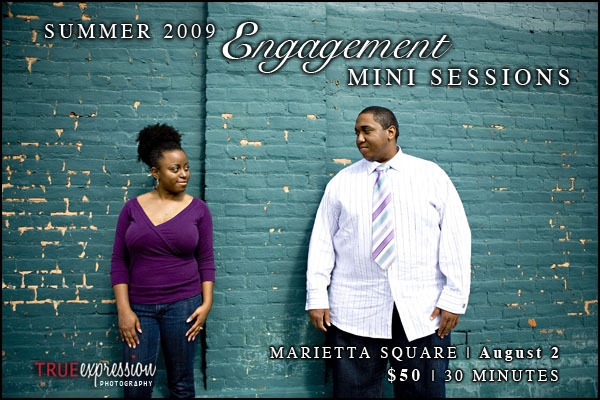 Summer engagement mini sessions will only be held on one day! The cost is $50 to reserve a time slot. The fee includes your 30 minute session and a choice of either a $25 print credit or 25 custom photo Save the Date cards. Email info@trueexpressionphoto.com to reserve your time slot!